You will be amazed by the unique screens used for this house! You might want to add one to your home too. It is indeed impressive that no matter how simple a house looks like at first glance, there are certain features that will set it apart from other homes. Well, sometimes, first impressions doesn’t last, right? There are times when we end up getting the surprise of our life when we find out that something has actually more to it than what meets the eyes. If you try to apply it to your everyday activities and other goings-on in your life, you might say yes. But how about for a home? Could this be right as well? Actually, yes. 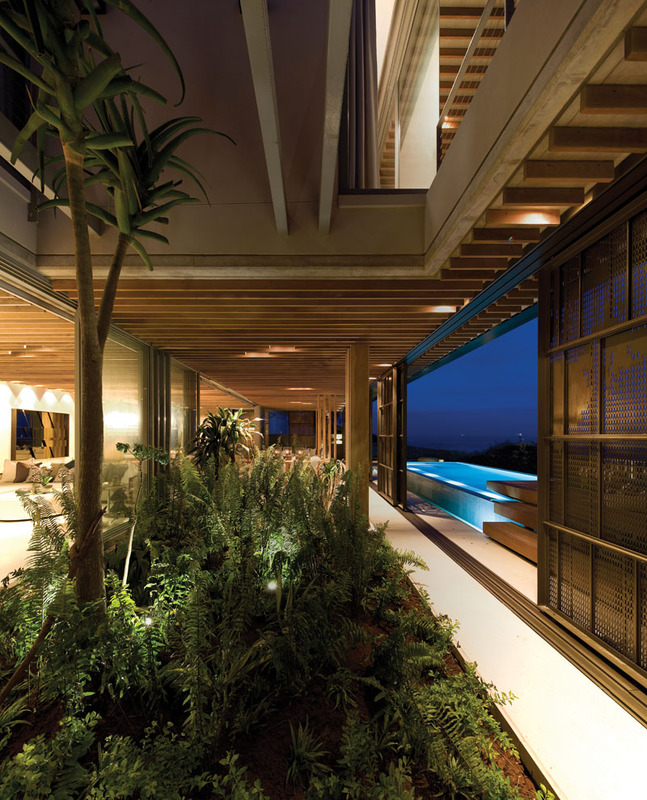 A very good example is the La Lucia house which is designed by famous architecture firm, SAOTA. What made the house unique? At first glance, this home in South Africa is just a simple rectangular home. But once you dig go nearer, you will see that it has lots of impressive features. One of that is the anodized bronzed aluminium sliding screens. These are not mere decorations. Aside from creating a unique appearance, it can also protect the house from wind, rain, and sun. Want to know more about this house? Scroll down below for the home’s photos. 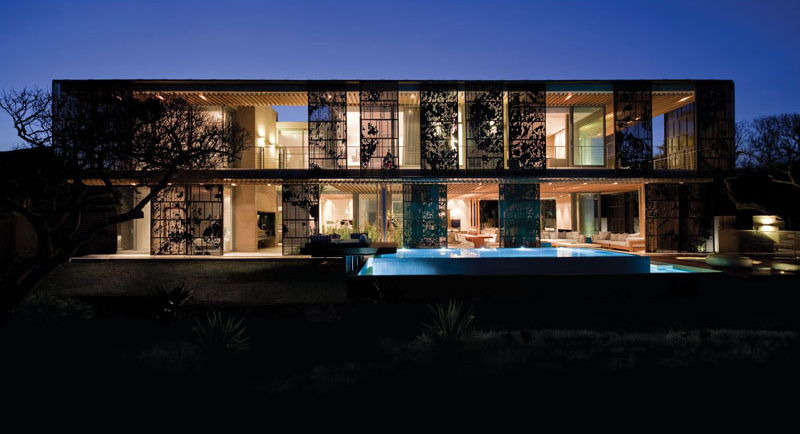 Unique feature: The house features anodized bronzed aluminum sliding screens that give it a unique appeal. It also has an indoor-outdoor connection that will leave you in awe. The designers describe the house as a delicate seaside retreat located on the edge of the waters. 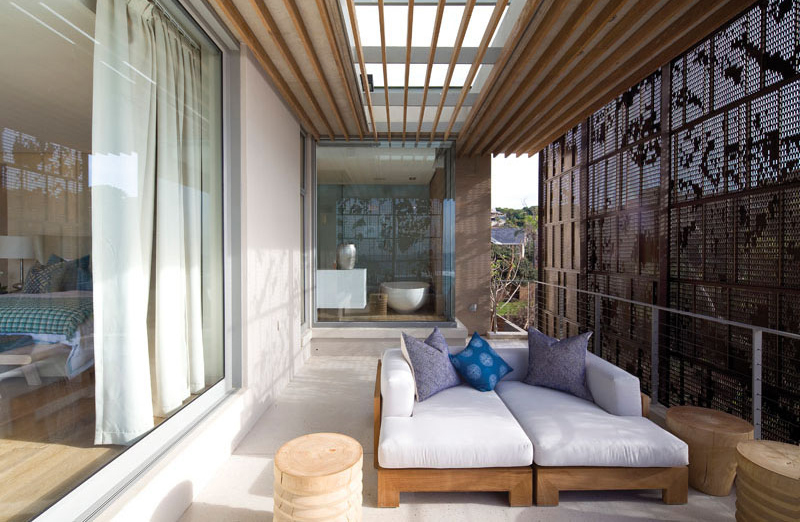 SAOTA also added that the house can cocoon itself with its sliding screen panels. The house features indoor and outdoor living as well as a garden courtyard and protected garden. At first glance, the house is just a simple rectangular structure. But there is actually more to it than just that. During the night, one can see the lovely details of the screen panels like what we can see in the picture. Once inside, one can see a double-volume entry hallway. A staircase sits here which leads to the upper level of the house. There are also aligned timber slat clad ceilings which adds to the home interior’s appeal. 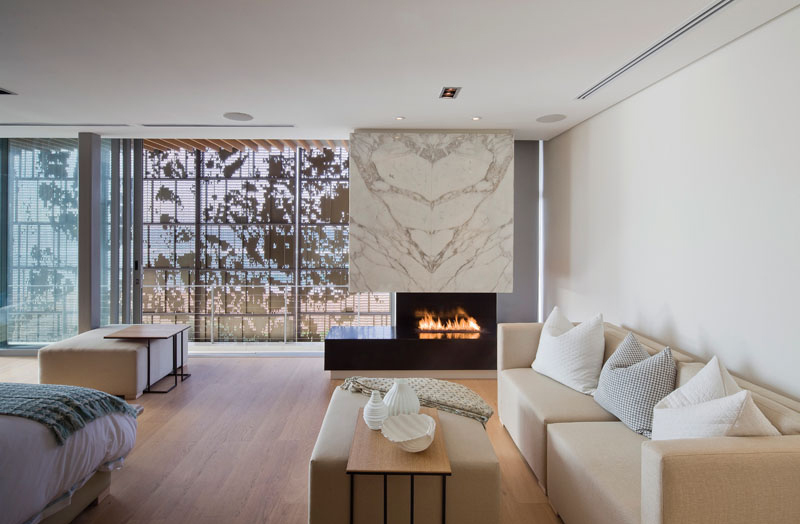 The aligned timber slat clad ceilings draw the eye to the seascape like what we can see in this living room. 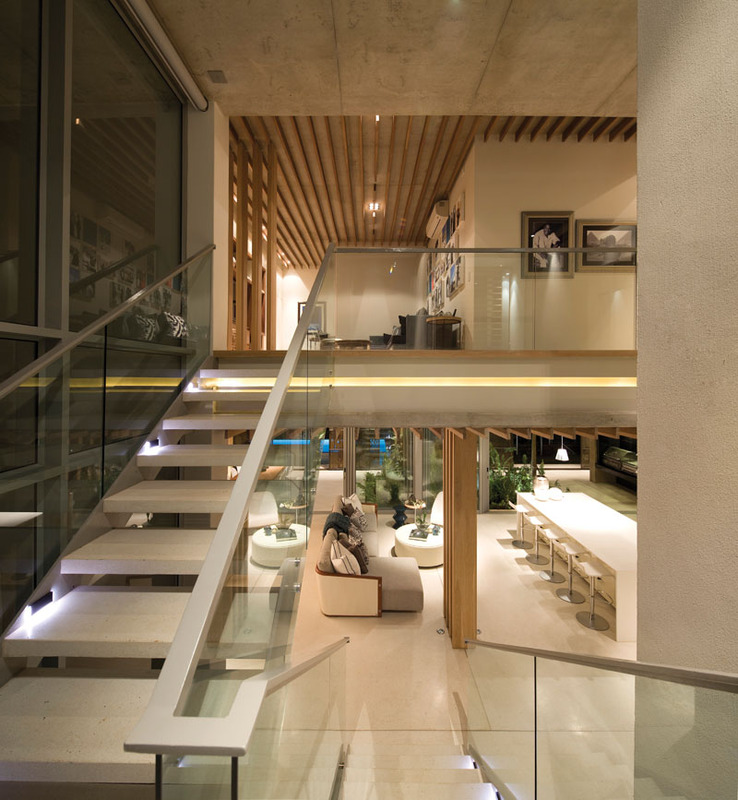 The interior also features sand-colored polished concrete floors and bleached timber. It used natural leathers and grey linens that are anchored by soft neutrals. The living room has sliding glass walls that can be opened to create an indoor/outdoor living environment. It connects to the terrace where a secondary living room and dining area can be found. The decorative screens provide shade and it brings an artistic touch to the space. Natural tones are used in the interior with some pops of azure colors from the throw pillows. Notice that the interior has an open floor plan which gives the homeowners an access to all areas of the house. You can also see here the large sliding glass wall that separates the indoor and outdoor living and dining areas. 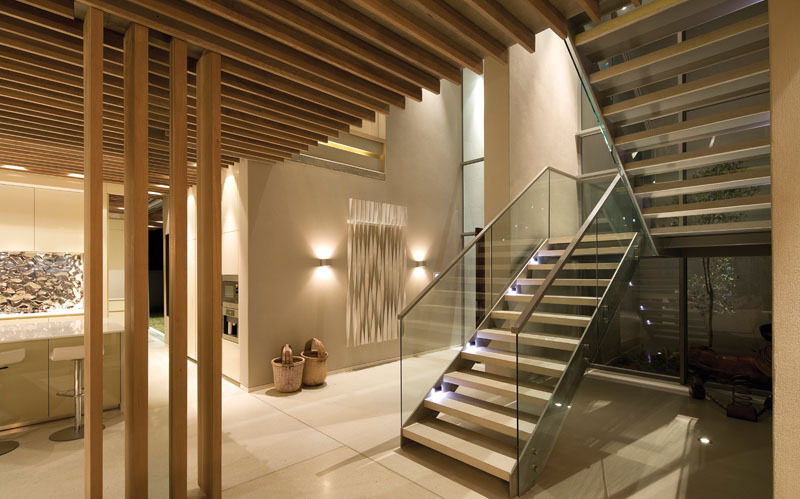 Concrete stairs with glass railings are used in the home. The stairs match the floor throughout the interior. The same timber slat clad ceiling is used in the upper level of the house. This is the master bedroom which is very spacious! It features a fireplace and a sitting area. Overall, the space has a calm and cozy environment. You can also see the screen panels here. From the bedroom, there is a balcony where a second sitting area can be found. What we can see here is balcony of the bedroom. Isn’t this a very relaxing place? It would even be nice to read a book here or drink your coffee in the morning. The master bathroom has a long vanity and a white freestanding bathtub. 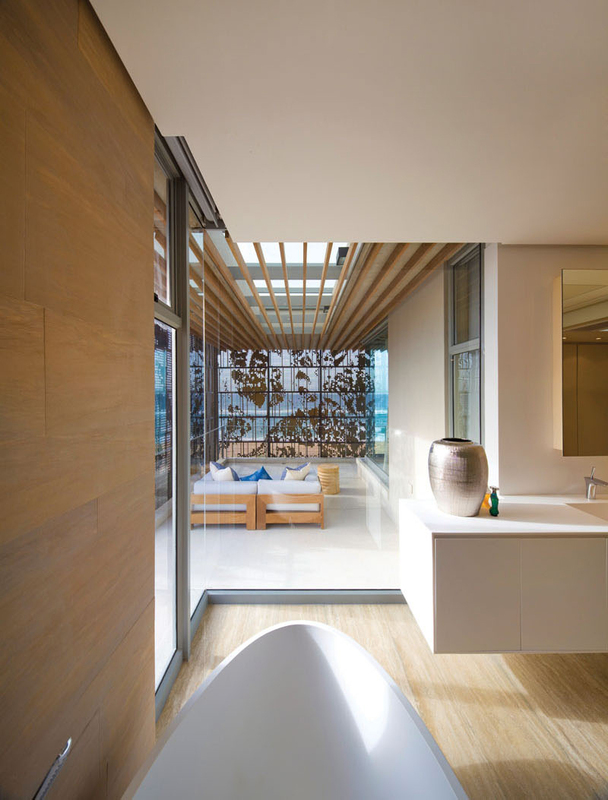 From the tub, one can look out to the balcony through floor-to-ceiling windows. From the master bathroom, one can see the terrace. These areas are all connected to the master bedroom. Can you imagine how spacious this house is? Another part of the house that is an envy of their neighbors is the pool area with wooden decking. This sure is a lovely spot to relax and unwind! When the decorative screens are open, it can expose the outdoor living spaces not just to the pool and surrounding deck but also the stunning view of the ocean. Although there is a lot to discover in the outdoor area in terms of plants and gardens, the homeowners opted to have an interior garden that is filled with lush plants. This sure is a beautiful spot! When a guest arrives at the house, two milk wood trees will greet them. 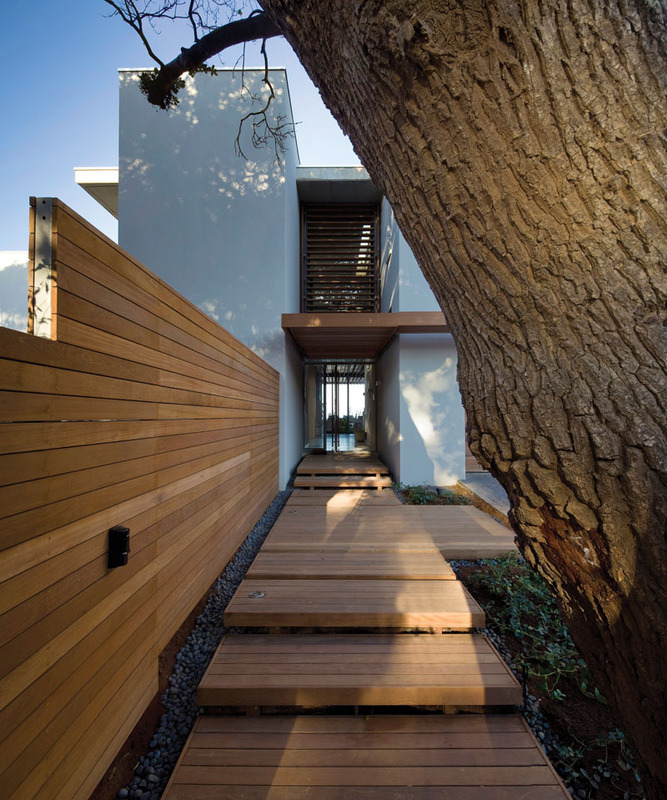 There are also floating timber step platforms and a pergola that lead towards the front door of the house. 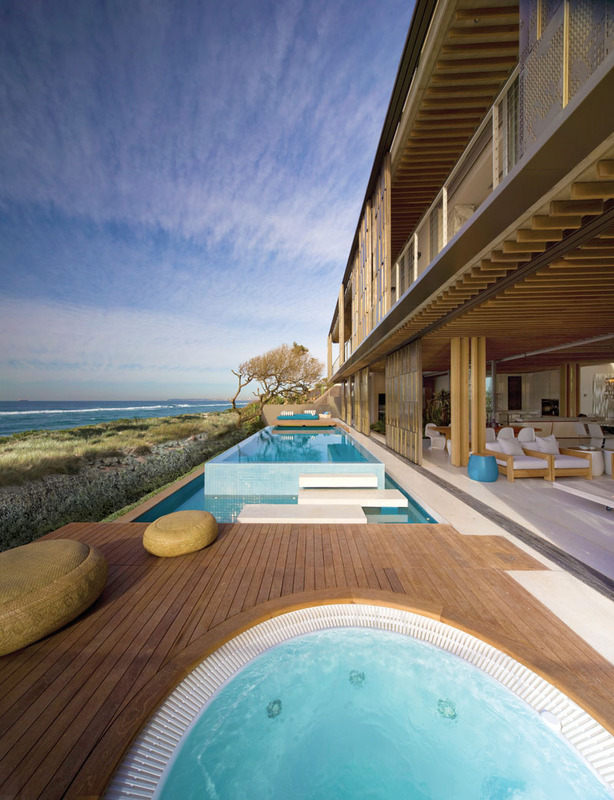 This house is another awesome project from SAOTA. 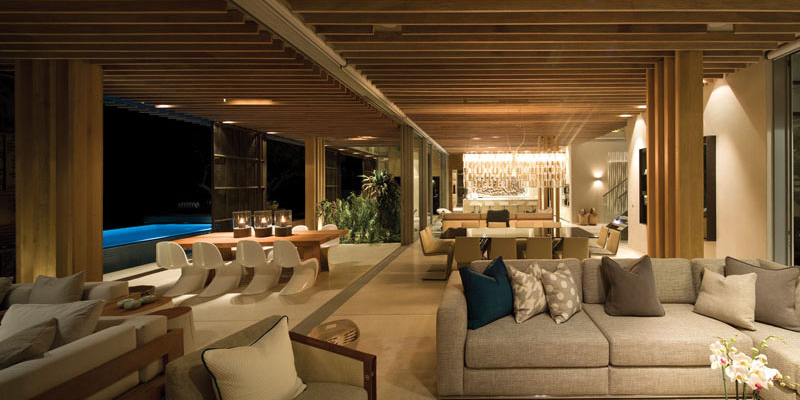 If you are a fan of beautifully designed homes here on Home Design Lover, then you have surely seen other great works of SAOTA. I could say that I am definitely a fan of their designs because apart from their modern appeal, they have impressive functions and usability! Just like the unique screen panels that this house used. It is not just for decorative purposes but it also has a lot of usages too! Apart from those mentioned, can you tell me other ways that the screen panels could help a home? Or would you consider adding one to your own house?